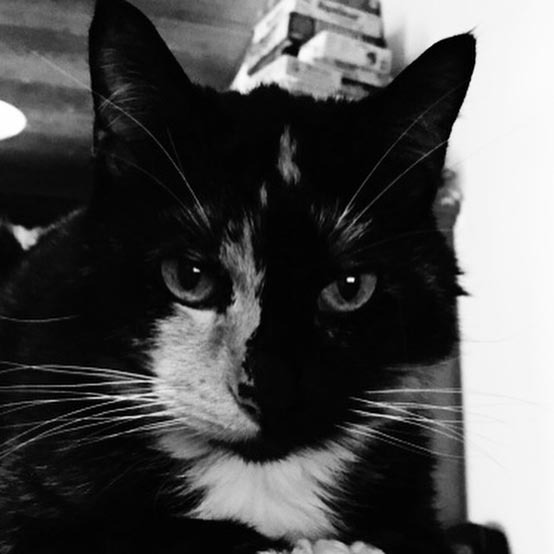 I just lost another family member, because my beloved cat Harriet had to be put to sleep. 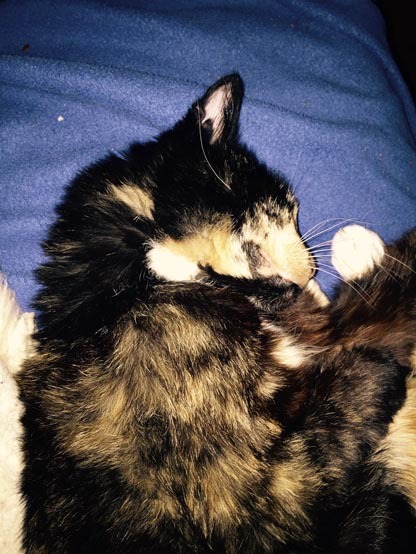 She had an exceptionally good run for a cat, falling just shy of 19 years old. 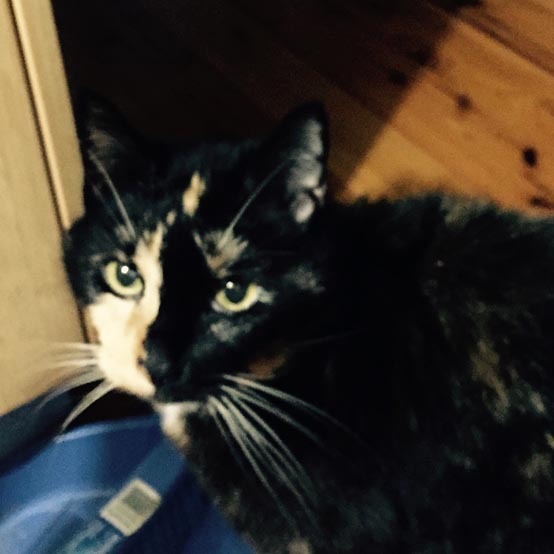 Harriet is now with her sister, Guess, who we lost a few years ago (her story is amongst the short stories here), and that means we’re a one-cat household… with a very confused cat wondering where her sisters have gone. As usually seems to be the case, I’m writing to make sense of this in my head, because very little does right now. It’s been a very stressful, depressing and difficult time over the last four weeks for a variety of personal reasons I won’t go into right now, and losing Harriet is just… it’s a punch to the guts. 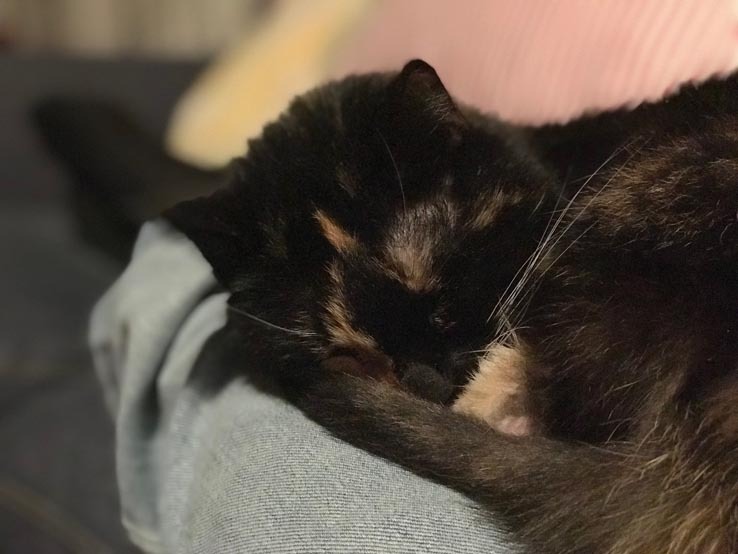 Harriet’s been part of my life for the last 19 years, and like her sisters, she was a housewarming “gift” when we first moved into our home. Indeed, you could say that I bought a house in which to house Harriet, because one very strong reason why we shifted from renting to buying back in the day was because we very much wanted to have cats. Harriet was the first cat we “chose” — although I’m very much of the view that both cat and owner choose each other, and that it’s a very different relationship than with dogs or other pets — because she had such a striking split face. It was rather a visual clue for her personality as well, because she could be very skittish, to put it mildly. That was partly because she was very much put upon by her sisters, especially Guess, and just partly because that was the cat she was. Despite her tiny size, she had one of the loudest purrs I’ve ever heard out of a cat, as well as a particularly sweet and high-pitched miaow. Somehow, even when she was angry, her miaow was sweet. Don’t ask me how she managed that — she just was that. I’m trying hard to keep the fond memories at the front now, and in terms of Harriet stories, there’s one that springs to mind. About 10 years ago, we decided to switch from the threadbare carpets that in our living room to having the floorboards polished, if only because they’re a lot easier to keep clean in a house with 3 kids and 3 cats. Carpet was torn up, carpet staples painstakingly removed from the boards, and then we got someone in to do the sanding, sealing and polishing. A noisy and smelly job, and one that’s not cat-compatible in any way. Except that at the time, I was also working out of my home as a freelance journalist, which meant I had frequent courier deliveries. One particular courier — and people who know me know I often have a special relationship with couriers — stupidly opened up the door to the laundry rather than the door I was using on an ad-hoc basis while the floors were being done… and all 3 cats escaped. The other two were, thankfully rather rapidly recaptured, but there was no sign of Harriet. So we did what you do, and scoured the neighbourhood looking for her, dropping leaflets and asking all our neighbours to keep an eye out for her. She was quite the distinctive looking cat, but days passed, and nothing. 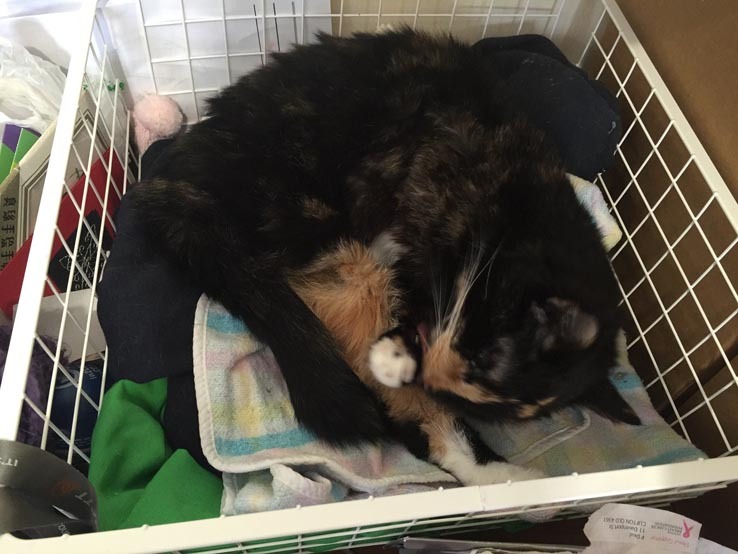 The days turned into weeks, and after a fortnight, we figured that, sadly, with our home backing onto a national forest, that Harriet was probably gone. Then at 3am one morning, my wife woke me up. Now, I’m bleary from sleep, and I don’t know if this is a burglar or a possum, or even just a dream that she was having, but I start to stir. She gets up to check the back door carefully, but there’s a clue that gives it away before she opens it. A very distinctive, utterly unforgettable sweet sounding yet angry miaow. Harriet was back, and angry with us, because as far as we could tell, she figured we’d moved the house. She’d survived on her own for three months, and while her claws were pretty shredded, she was otherwise in fine condition. She came back into the house, and never left again… until today. And now she’ll never come back. Damn. Excuse me, I’m going to have to go cry again.